China's Sui Wenjing/Han Cong won the pairs gold medal at the 2019 ISU Figure Skating World Championships in Saitama, Japan, on Thursday. Sui/Han, produced a nearly perfect free skate, earning a score of 155.60 points and collecting 234.84 to win the title for the second time, as they had claimed it in 2017. "I am happy that we skated two complete programs here," said Sui. "We encountered many difficulties this season, but we will always fight for glories." Russia's Evgenia Tarasova/Vladimir Morozov took the silver in 228.47, while another Russian pair Natalia Zabiiako/Alexander Enbert took the bronze in 217.98. China's Peng Cheng/Jin Yang came fourth in 215.84. 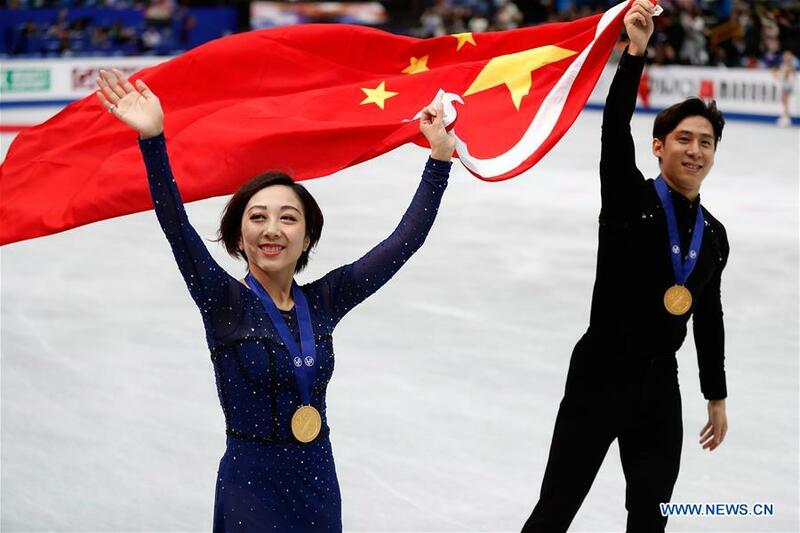 China's Olympic silver medallists Sui Wenjing and Han Cong won pairs free skate gold with a stunning routine at the World Championships in Japan on Thursday.